Genealogies of Mahāyāna Buddhism offers a solution to a problem that some have called the holy grail of Buddhist studies: the problem of the “origins” of Mahāyāna Buddhism. In a work that contributes both to a general theory of religion and power for religious studies as well as to the problem of the origin of a Buddhist movement, Walser argues that that it is the neglect of political and social power in the scholarly imagination of the history of Buddhism that has made the origins of Mahāyāna an intractable problem. 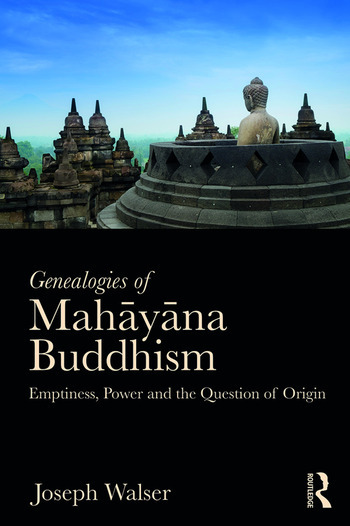 Walser challenges commonly-held assumptions about Mahāyāna Buddhism, offering a fascinating new take on its genealogy that traces its doctrines of emptiness and mind-only from the present day back to the time before Mahāyāna was “Mahāyāna.” In situating such concepts in their political and social contexts across diverse regimes of power in Tibet, China and India, the book shows that what was at stake in the Mahāyāna championing of the doctrine of emptiness was the articulation and dissemination of court authority across the rural landscapes of Asia. This text will be will be of interest to undergraduate and postgraduate students and scholars of Buddhism, religious studies, history and philosophy. Tantra, Emptiness and the Reincarnate Emperor/Lama, or why it’s never too late to have a venerable past. What did the text of the Perfection of Wisdom look like? The Context of Abhidharma Literature? The Context of Other Schools? Subhūti’s Araṇavihāra: Preaching or Penetration? Joseph Walser is Associate Professor of Religion at Tufts University, USA. "This book is a compelling argument to rethink the origins of Mahayana Buddhism. Approaching this perennial puzzle within Buddhist Studies from a different angle, tracing it from the present toward its genesis, Walser masterfully draws together material from a broad and complex cultural context to rethink the approach to understanding the earliest expressions of the idea of emptiness". Matthew Sayers, Lebanon Valley College Annville, USA. "A bold new theory of what the Mahayana is and how it "began," Genealogies of Mahayana Buddhism is a paradigm shift in our understanding of one of the most important traditions of Buddhism. Written in clear and accessible prose, Walser's work is essential reading for anyone interested in the history of Buddhist thought." José Ignacio Cabezón, Dalai Lama Professor of Tibetan Buddhism and Cultural Studies, UC Santa Barbara, USA.